Place the garlic, tahini and lemon juice in the food processor bowl and whiz until pureed. Add the walnuts and arugula and pulse to blend. With the machine running, pour the olive oil in a steady stream into the bowl, process until smooth. Season to taste with salt and pepper. Serve with crudité like carrots, grape tomatoes, radishes and broccoli florets. Scoop! 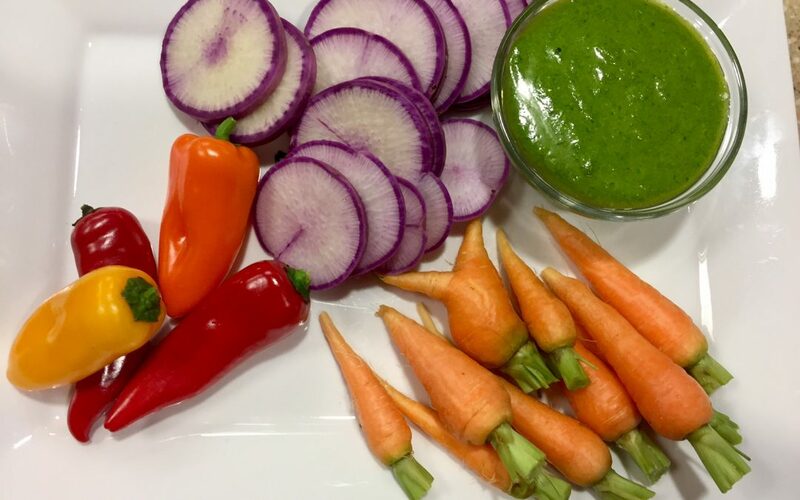 This pesto uses tahini, an easy to find condiment makes the sauce delicious and vegan. Tahini is ground sesame seed paste. It’s easy to find in the grocery store, check the international section. In a pinch, almond butter is a great substitute, adding just a little more nutty sweetness to the pesto. Clever! This pesto is a real “meal-maker” Mix it with some whole wheat pasta for dinner, create an easy salad by tossing it with grape tomatoes and a little mozzarella, or spread it on a sandwich instead of mayo to make a scrumptious lunch. In Spanish, ricotta is known as Requeso. It can be salted or sweetened for cooking purposes. Blend the cheese, sugar and melted chocolate together in a food processor until smooth. Spoon into wine glasses and place in the fridge for an hour to set up. While the cream is in the fridge, macerate the fruit in the liquor or juice. Remove the creams from the fridge, top with berries and serve.